Burger & Beyond, who have spent the winter at The Star of Bethnal Green, have moved into its sister pub The Star of Hackney Downs in E5. Expect awesome burgers like the 'Two's Up' (above), and 'The Cliff' a 90 day aged patty, pancetta bacon, monterey jack cheese and a tangy tarragon mayo. They are serving six days a week, Monday to Friday from 5pm - 10pm, and Saturday from noon. G-g-g-g-go! "The Cliff" which comprises of a 90 day aged patty, pancetta bacon, monterey jack cheese and a tangy tarragon mayo, alongside the"Two's Up"
This summer you will be able to find them at Glastonbury, Reading, Latitude and The Isle of Wight festival to name a few, and they have now taken up residency at Alexandra Palace for all main events alongside the likes of Smokestak, Anna May's and Bodeans. Burger and Beyond believe that their customers deserve nothing less than the freshly ground dry aged beef that goes into our Burgers, made from choice cuts of beef, no rubbish. 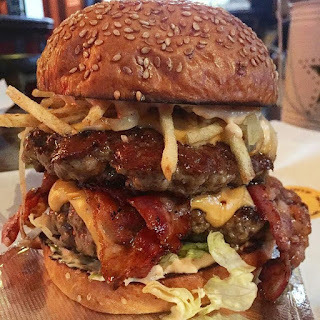 Drawing inspiration from Burger joints all over the world, from London to Miami, Vegas to LA, Berlin to NYC they know a good burger when they bite one and look forward to serving you some meaty happiness in a bun soon!"